You can find rocks on practically any of your outdoor adventures whether it be the beach, the lake, or the forest. But there are some that are a little bit better for painting than others. Art on the Rocks is packed with tips on how to find and prep rocks for painting. When you want to paint rocks as a hobby or for your craft projects, first you need to search for the right rocks. The most common place to find nice stones is at the seaside. Along the shores of beaches, you can find stones of different sizes, shapes, and forms. Rivers, riverbeds, or lakes are also wonderful places to collect stones. When you collect your stones, it is important to choose the right sizes, shapes, and textures for the designs you want to create. You can collect as many stones as you like, and decide later what to paint on them, or you can choose specific stones for specific designs. Smooth and flat stones are ideal for working with ink or markers. You can paint or draw directly onto their natural surfaces. Rough and textured stones also work well if they have the desired shape you’re seeking. I often choose my stones by their shapes: oval stones for owl or fish designs, round for mandalas, irregular shapes for bird or animal designs. Unique stones help increase my creativity by thinking of new ideas and concepts. Stones have different colors that can create special effects when you paint them. For example, naturally dark or black stones are great choices for monochrome designs using white, gold, or silver ink. White, smooth stones are ideal for painting bright colors. Even rough stones with a special shape can look great after applying a few levels of paint to them. After I collect my stones, I leave them in a bowl of water for a few hours to soak off any excess dirt or sand particles. Next I clean them with a soft brush and mild soap. After rinsing with running tap water, I leave the stones to dry for at least one day out in the sun or in a warm place inside, near a window. After they are completely dry, your stones are ready to paint! If your rocks are rough or porous, you can make them more smooth by adding a few coats of paint. Apply one or two coats of white acrylic paint, and once the paint dries, rub the surface with very fine sandpaper. This will help smooth the surface for your design. When you are finished painting your rock art, you will want to protect your work from sunshine, dust, or humidity. I always use a high-quality acrylic varnish (or varnish with UV protection). Varnishes can easily be found in craft stores or art shops. Once your painted stone is completely dry, apply two or three layers of liquid varnish with a wide brush. If you are using a spray varnish, spray outdoors or in a well-ventilated area, wearing a mask. These kinds of sprays are highly flammable. After you have applied varnish, wait at least 48 hours to use your stones. 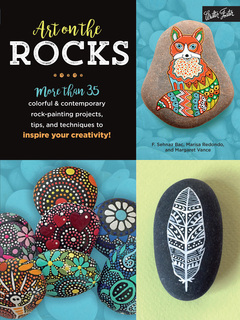 Turn plain rocks and stones into beautiful works of art!